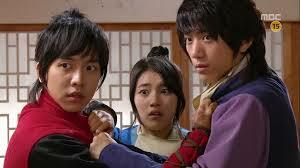 This week marked the end of MBC’s hit Monday / Tuesday drama Gu Family Book. Consistently grabbing the top spot in ratings for its timeslot GFB’s critical reception was mixed. This drama was much anticipated due to the cast (Lee Seung Gi, Suzy) and the director (Secret Garden, A Gentleman’s Dignity). Such pre show buzz inevitably brings a lot of expectations for a drama to live up to. In my opinion GFB had mixed results given the hype. How you ask? Never fear, I will begin rambling now. Cheers! Yes-I will segment GFB’s plot and call this portion insanely fascinating and well played. Unfortunately I cannot say the same for the rest of the script. The initial love story of GFB was a backstory introduction to our main character’s motivations and place in this drama universe. I doubt the writer’s anticipated that this introduction would be so well received by fans and critics alike it would overshadow the main loveline of the show. Wol Ryung, a thousand year old Gumiho, found unexpected love with the daughter of a deposed nobleman, a young woman named Seo Hwa. Together they presented a heartbreaking tale of love and betrayal that set the stage for the rest of this series. Their love, so short and so desperate, was what got me hooked on GFB to begin with. Once the backstory ended and we sped up to the present events of this drama I found myself missing the original reason I was sucked in. Which makes me wonder- is it a bad thing to have such a powerful introduction to a show when the main characters are not part of this crack like beginning? I am starting to think so. Gu Family Book could occasionally bring the funny. Occasionally is the key word here. There were some moments that had me in stitches (Gon and Kang Chi rolling around fighting in bed for example). I liked the camaraderie among the martial arts school- especially the moments our hero spent figuring out who among the peeps and old chefs were “masters”. Stories with strong ensemble casts draw me in. Gu Family Book had moments of this- brilliant, bright, fleeting moments. 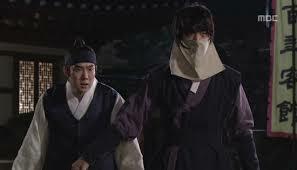 Bong Chul and his sudden dedication to Kang Chi was funny for me, every time he ran to help his new BFF was priceless given their past of bitter opposition. I also enjoyed Tae Seo’s flip flopping brain washed moments! Wait…I don’t think that was supposed to be funny. Umm, regardless I still laughed. 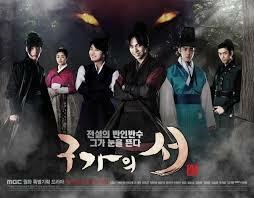 The majority of my negative criticism of Gu Family Book can be summed up in a simple sentence: The writing sucked. Plot points were dropped off randomly, horrible dialogue, and inconsistent characterizations are my major complaints. Every episode seemed to take a new turn that never quite jived as whole. After episode twelve I began to feel as though I could no longer trust in any built up premise because more than likely they would conveniently go away as soon as the writer decided that the story should turn more one way than another. The scriptwriter for GFB is not a newbie- she also wrote King of Baking, Kim Takgu as well as Dal Ja’s Spring. I think that makes this drama even more disappointing; while KOB was makjang it was at least engaging enough and consistent enough (just enough, mind you) to keep my critical side interested. GFB turned out to be a show that I just watched. I was not engaged in the story past episode six, I was just viewing to see what happened. The plot of GFB was all over the place; it was hard to tell what the overall goal of the story was. Was it about redemption in becoming human through love? Was it about overthrowing evil? Was it about the need to adapt to survive, no matter what hardships occur? I have no freaking idea because none of these suggested storylines were completed in a logical or conclusive manner. Our characters often did things that made little sense (I really think Tae Seo could have been written out of this story with zero effect, the guy only did things to kind of make the plot go forward, kind of). Noble idiocy was plentiful- almost every character made a brainlessly stupid sacrifice due to some preconceived notion of good which almost always played out to be just…Um…idiotic. Our main loveline could have been a great story but the couple’s dialogue and situational focused romance fell flat. The underlying theme of protecting one’s family was so inconsistent (sacrifice your daughter anyone?) that I stopped caring who and or what these characters were trying to protect. The villains in this drama and their nefarious deeds were James Bond OTT laughable and predictable. I could go on all night about what elements in this show disappointed me. Which in and of itself is disappointing. I had such high hopes for this drama (maybe because of LGS- okay because of LGS) but they were dashed apart like a million blue glowing floaty magical ball things. 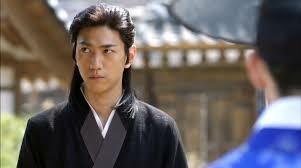 Which is what I consider really, really bad about Gu Family Book. Cheers! I dropped it after 10 eps and I completely agree that the plot was all over the place…. I never made it past ep 6 but I’ve been halfway following the story since then (meaning.. stalking blogs because I’m still too lazy to read full recaps). Having so much fun now reading everybody’s vomit about the ending. Hehe. Oh how I’m glad I didn’t bother to finish. I think I like hearing about it much more than if I had actually spent time from my busy day to watch it all. I thought I was the only one who loved Gumiho daddy and his story! I felt like if the show had been 16 episodes of seeing him turn from a gumiho to a human, I would have enjoyed it so much more! I was excited every time we got a glimpse of Gumiho daddy. After the mom betrayed him I was done with her until she did what she did at the end…. What did you think of the ending scene? I only watched the show for Gumiho daddy! Every time he wasn’t around I wasn’t interested. It should have been 16 episodes about his love, betrayal, and change from mythical being to human. . Yes viva to pappy Gu who was so much more charismatic and sighhhhhhhhh. I watched it in full. The second time round I watched episodes 1,2, 13, 14, 19, 20 and 21….that for me was the story pappy Gu and his love. So mature….like well matures wine…..sighhhhhhh.